​What did I do today? We all should have more days that give that deep sense of satisfaction. The good feeling that comes with investing in yourself and getting good value for your money. I was blessed to have such a day today. First we had to introduce ourselves and businesses, then renew intentions to dedicate it all to Allah (the Enricher). I liked that the setting was relaxed and so it was easy to get comfortable. Factors like age, success and profession posed no barriers. This facilitated learning from one another. There was so much to learn! 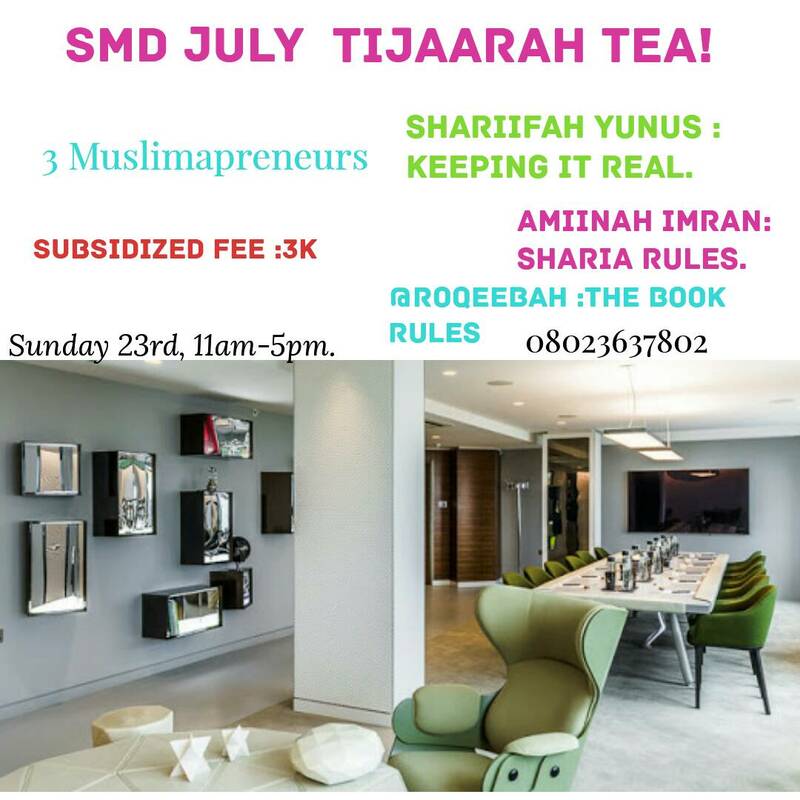 The lady behind SMD – Shariifah Yunus, a culinary artist and instructor, gave a passionate talk about her experience as a Muslim woman starting and running a business, confidence, positioning, advertising and lots more. Next up was the session by Ameenah Imran, a seasoned and dedicated student of the deen, who took us through transactions that are forbidden in Islam. Making sure our business is based on halal (lawful) is very important. We also learnt about permissible transactions, putting Allah first and of course I was motivated to take learning about rulings and other fields of knowledge in Islam more seriously. The last talk was about product photography by the creative Roqeebah Olaoniye- editor, photographer and legal consultant ( @roqeebah). She patiently coached with practical demonstartions us on how to get the best of apps and photos to sell our products and services. It was such a trove of treasures! In between , we had breaks for Salah( prayers). Question and answer, with interactive sessions shed more light on issues. Ideas were flying about ready to be caught by the open-minded. Tea and lunch were welcome treats, all made with SMD natural tea and spices. The tea, burger and Ofada tasted so good. You should try cooking with them too. I am glad to have made the acquaintance of business owners and budding entrepreneurs whose interests ranged from crafts, health, travel services to food businesses. Supporting each other in growth and development was a priceless lesson. As women, we should build each other. And as Muslim women, we must treat each other with honour accorded to sisters. In all, I met new people, reconnected with old friends and took away a zeal to run a successful business enterprise.